Bob works as a practitioner consultant using ThinkTank, a collaboration-as-a-service software company. By providing a collaborative structure to the way people work together, ThinkTank enables leaders to transform business processes and create a culture of collaboration, innovation, and engagement. Bob recently facilitated something remarkable: a (successful) virtual collaboration experience with over 100 people from around the world that lasted 90 minutes – and he did that four times in one day! It was all people ages 27 to 30, so all millennials, and they really embraced the virtual collaboration experience. In a live group, you may not get everybody’s thoughts or ideas. ThinkTank has the ability to get all the ideas from people from everybody in that group, which makes it a much more richer experience, from a learning perspective, than just getting responses from two or three people in a live audience. Because nobody had to get on a plane, nobody had to travel, nobody had to be away, and nobody had hotel room, it was MUCH cheaper than training 400+ people in person, using the same exercise. Optimized and effective onboarding processes. Possibly even a virtual improv course! In a world where change is happening faster and faster every week, we have to learn faster – and the way we learn faster will be learning through collaboration. Bob: [00:00:00] I believe that you do need to bring people together and have live collaboration community discussions in order to really get people engaged. Peter: [00:00:52] Welcome to episode 63 and today my guest is Bob Dean, who is the founder of Dean learning and Talent Advisers. Bob works at the intersection of learning and development, talent management, and facilitated collaboration. Building on experience as a chief learning officer and a global talent management leader, Bob consults with companies on how to accelerate behavior change and business results from investments in people. Bob uses an innovative collaboration approach in working with clients to drive optimum results from business change projects. Bob is working as a practitioner consultant Using ThinkTank, a collaboration-as-a-service software company. By providing a collaborative structure to the way people work together, ThinkTank enables leaders to transform business processes and create a culture of collaboration, innovation, and engagement. Bob serves as a collaboration experience designer and facilitator delivering both face to face and virtual sessions for ThinkTank partners and other clients. Our conversation is framed around ThinkTank, collaboration, and an article that we wrote titled The New CPE: Collaborative Learning Experiences. Before we get to the interview, I like to talk about Listen Learn and Earn. I have partnered with the Maryland Association of CPA and the business learning institute to bring exciting new learning opportunity for accounting professionals to earn CPE credits you can earn up to one self-study CPE credit for each completed pie cast episode purchased for only $29 through the Maryland Association of CPA and the business learning institute self-study website. The podcast episodes are mobile friendly. Open your browser on your smartphone tablet or computer. Go to the Imay CPA belie self-study account and listen to an episode. Take the review and final exam while you’re working out. After listening to an episode on your commute to and from work. It’s that easy. While I also liked that improv no joke podcasts are available on my web site. Only those purchased in the CPA be self-study Web site are eligible for C-p self-study credit. You can get the detailed instructions by visiting my website at. Peter Margarita’s dot com and click on the graphic. 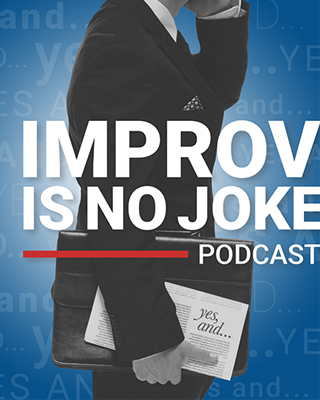 Listen Learn and Earn improvs is no joke podcast on the home page. I hope you enjoy this exciting and flexible way of earning C-p credit. OK now let’s get to the interview with Bob Dean. Peter: [00:03:35] Hey Bob I greatly appreciate you taking time out to be on my podcast again. Second time so thank you so very much. Bob: [00:03:43] It’s my pleasure Peter. I’m looking forward to it. And we always have good conversation. Peter: [00:03:48] Yes we do. You are in Episode 31. And a few weeks ago we were having you were sharing a story with me that related back to an article that we coauthored, a white paper in 2012 titled The new CPE collaborative learning experiences, and I thought it would be great for the audience to hear the story that you shared because it’s it’s quite frankly pretty amazing. Bob: [00:04:14] Yeah sure. When we wrote the article I was really focused on my use of ThinkTank as a collaboration tool and I saw great potential for using it for learning and development. Virtual learning and development and that was five years ago. And since then as you know I’ve done a lot of virtual classroom sessions using ThinkTank which is highly interactive and in a way that is more engaging than anything I’ve seen on any other platform. But now I’ve recently had an opportunity to truly facilitate collaboration learning community with over a hundred people virtually. Peter: [00:04:57] Wow. And before we get into the crux of the story can you explain or describe what ThinkTank is? Bob: [00:05:06] Yeah they take is a 25 year old collaboration software that is very unique in that it was born out of research at a university. The research was on collaboration and the faculty doing the research found that there were some critical success factors to great collaboration and one of them was anonymity. And so they looked around and said well there’s nothing out there now that allows us to do anonymous collaboration. They built ThinkTank. They took it to market and it’s being used by a number of large companies globally. And I’ve been using it myself in my consulting business for the last six years. Peter: [00:05:53] I had purchased a license and was using it and not as familiar with ThinkTank as you are. But I’ve got a working knowledge of it and I had been touting that the power of it as a collaborative learning platform and people still give me that kind of a Scooby-Doo awrrooo. Can you describe this to me. I’ve told them to go back and listen to episode 31. We talk about that as well as I’m pointing in to this episode to talk about you. You had a virtual collaboration with over 100 people? Bob: [00:06:27] Yes. Yes, and it was for 90 minutes. Peter: [00:06:30] OK so how did you do that? I mean I got a headache just thinking about trying to do something like that. Bob: [00:06:36] Well it wasn’t much different from if you had a conference in a ball room in a hotel and you had a speaker who perhaps laid out some provocative ideas and questions for the group in the first 20 minutes and then they went off to break out. Now with 100 people in the hotel you would need 10 breakout rooms right. And you’d have to move people and hope that they made it there on time and have a facilitator and try to record what they were doing, and then report back. Right we’ve all seen that model right. Bob: [00:07:12] Well basically we get the equivalent of that virtually. We had a keynote upfront for about 15 or 20 minutes. The participants all listened to that and there were slides a few slides. They could type in questions if they had questions about the slides and the content. And then once that was finished we then took them into 10 virtual breakouts and these were people that were already in communities if you will. We knew what community they were a part of. The communities were all listed in ThinkTank in an activity, one activity, and everybody followed instructions, went into the right community and ThinkTank by clicking on it, and then went into the conference call break out by using their conference line. And obviously to get everybody in the right place and with 100 people you needed it to be almost perfect because you didn’t want a bunch of people saying I can’t I can’t get into my community, what’s wrong? Bob: [00:08:22] So you had to rehearse it. You had to give good instructions. And then, with fingers crossed, everybody got in the right place and there were facilitators in each of the virtual breakouts that then went another 40 minutes with community discussion and use of ThinkTank to record ideas and questions. So no flip charts needed because we recorded everything in ThinkTank. Peter: [00:08:49] So let me think about this… so you get it in the breakout rooms and you facilitating this yourself or did you have somebody helping you? Bob: [00:08:57] Each community so again imagine 10 communities with 10 people each up so a hundred people. Each community had a designated leader. Bob: [00:09:07] And we had had a call with the community leaders a few days before to walk them through what their role would be with a group of ten and what they would need to do in ThinkTank to get their participants to record their ideas and use ThinkTank effectively. And again it would be akin to having if you had five flip charts in a breakout room, and People were supposed to write their ideas on different flip charts. It’s basically the same thing except they were in a ThinkTank activity and they recorded their ideas and ThinkTank. But they were also able to talk. So there was a combination of verbal discussion and recording of ideas and thinking. Peter: [00:09:51] So the demographics of this group of hundred… they were not in one location they were spread out for United States or even around the world? Bob: [00:10:01] We had people at one hundred desktops in 100 locations. Peter: [00:10:04] And 100 locations all coming together to… And I assume after the keynote was done when they got into the breakout sessions where were these sessions pre-populated with questions that you wanted the participants to answer? Bob: [00:10:20] Yeah that’s a great question. We designed a ThinkTank that every right out was was pre-populated with several questions, and each break out had the same questions. So you’ll find as interesting. As the overall facilitator, once I had them in the breakout, I felt like an air traffic controller. I could actually go and look in on every breakout just by clicking on ThinkTank, and I could actually see if they were working and if they were engaged and when I could go in there and see that all 10 had activity going on it was really exciting. Peter: [00:11:03] Was it the same activity in all 10 groups or did each of them have a specific activity? Bob: [00:11:08] Yeah for this session they all did the same activity. They all had the same questions they were answering. Right. And so if you can imagine the facilitator says. “All right quick on the question number three. And I’d like you to take two minutes to answer the question.” So everybody’s typing all 10 people are typing in answering the question, and then he them down a few responses that he or she wanted to drill down on and because in ThinkTank you can not only have anonymity but you can also turn on name tags if you want to. We have the name tags on so you know I can see the ideas and say “Hi Jim. You have a really interesting idea. Would you speak about it to the group?” and that was all going on in the virtual conference call breakout rooms. Peter: [00:12:01] So all this information is being captured. Now when someone’s speaking on the conference call, is that information been recorded as well typed in the ThinkTank? Bob: [00:12:11] You can record it. You know any sophisticated conference call lines can record. But you know how that is. I don’t know that anybody’s ever going to go back and listen to those recordings. Peter: [00:12:23] So some of the information may not be caught in this if if if somebody is not scribing it and but… So you’ve got 10 people and how many questions do they have to answer? Bob: [00:12:36] They answered three questions. So they just moved from one to the next. We’re guided by their facilitator. And you know again this is all new. We’ve now done two of these two consecutive months in a row with 100 hundred people, and again we did this four times. So we’re talking three to four hundred people in four sections. Bob: [00:12:59] You know I have to say, we probably found out that we don’t have enough time in the break because when we get the feedback at the end the biggest comment is need more time in break outs. Bob: [00:13:14] Oh yeah. So what started out being 90 minutes should actually be two hours. Peter: [00:13:20] So an extra 30 minutes would be a game changer as well. Bob: [00:13:24] You know you can relate to this you’ve been in breakout rooms where somebody comes to the door and says you have five minutes to finish up and you’re in a really good groove. You’re like well we’re not we’re not close to being done yet. Sorry, you got five minutes and we’re reconvening. That same that same dynamic happened in ThinkTank virtually. And you know we can tell about it. I was the air traffic controller with some groups were not getting finished with all the questions. Peter: [00:13:51] Interesting. I like using the air traffic controller analogy because I do believe in your son an air traffic controller? Bob: [00:13:59] Yeah he he passed through the FAA Academy and I know a lot about that. And you can see all the planes converging on your airport right. Well in this case I can see all the breakout rooms. Imagine you get a big group like that. Can you imagine if you could sit in front of 10 monitors and see what’s going on in every breakout room? Peter: [00:14:18] That would be way cool. Bob: [00:14:20] I had that I basically had that ability. I just was only seeing what they were writing down. But I can sure tell whether they were engaged in the topic or not. Peter: [00:14:31] And that’s one thing about about ThinkTank to the audience is the fact that everybody participates. You get everybody’s thought. Especially when they’re quote unquote invisible, nobody can tell who it is. The amount of information that can be captured on ThinkTank far exceeds what we could do in a live classroom. Bob: [00:14:57] Yeah it was amazing and again I don’t want to make it sound like this was just taking what you might do in our conference and break out and putting it online because we can do a lot more. But one of the things that was interesting is once we returned from the breakouts and we were all back on the main conference line, we took people into another activity and you know how when you come back from break guards and you go back to your tables oftentimes you want people to report out to the main group? Bob: [00:15:30] We did that reporting out in ThinkTank as well. We had the community leaders answer a question about you know what were the biggest takeaways for your group and they just type them all in, and then we had the participants answer a different question about you know What help that they need in the overall learning solution in order to keep up the momentum. So we have different groups working on different questions and then when it was all done we did it all in the main room. Peter: [00:16:01] That’s outstanding. I mean when you were sharing the story with me a few weeks ago I was I was mesmerized quite frankly of what you were able to do with such a large group. Because when I was introduced to ThinkTank by you this number keeps ticking in my head. You really don’t want anything over 25 people in there and when you told me and over 100 and you facilitate over 400 in a day… that just blew me away. Bob: [00:16:27] Yeah well you know I I think ThinkTanks come a long way in the last six years I’ve been using it. And you’re right I would have been very wary of doing this many people. But one of the things about ThinkTank and you know this from using web access and go to meeting things… when you have a presenter with a hundred slides, not only is that a problem for engagement but with some platforms it may cause a performance problem in the platform. So with this ThinkTank session we only had about seven or eight slides, and because of that having 100 people on line was not a problem. It’s the slides that can really find a weigh down the performance of any virtual meeting or learning platform. Peter: [00:17:17] Correct. Yeah. We tend to be a little bit to slide heavy where we should be know take the Abraham Lincoln approach where less is more and have more engagement, and whether it’s a virtual classroom or a live classroom. Bob: [00:17:33] So I have to give credit to my client because they’re the ones that really pushed this and said we want to do a hundred and fifty people, and you know failure is OK. If it doesn’t work, we’ll learn something. And we ended up with a hundred because you couldn’t get everybody there but it was incredibly successful. I really… I can’t say I had any problems at all. The biggest lesson learned was I had a code leader. I was leading all the ThinkTank facilitation and then I had a colleague who handle all of the conference call line logistics. I’m glad I didn’t have to do both. Peter: [00:18:19] Yeah that would have been a lot. So you said some of the feedback was we didn’t have enough time in the breakdowns. What were some of the other feedback the participants were giving you about the experience? Bob: [00:18:32] Well they they just really enjoyed having to be being able to have a meeting with their community team and being able to do it virtually you know and not have to get on any airplanes, which they knew they wouldn’t have been able to do. And being able to do it where everyone got away from their work and spend 90 minutes to gather, and it was the first time of what could end up being a monthly session. So there was a lot of excitement about how well it worked. But I’ll tell you another insight I had Peter was the demographics of this group was all basically people probably between 27 and 30 years old. Bob: [00:19:19] I was the only baby boomer. Bob: [00:19:21] And they were they were all millennials. And quite frankly I haven’t done a session where I have all millennials. And it was almost like ThinkTank was just intuitively obvious to them, and nobody ended up getting lost. Nobody went into the wrong place. They just they know how to click around and they follow instructions and if they make a mistake they find their way back to the right place. Peter: [00:19:49] Wow. Yeah. Because I know when we’ve had these things back in the day with ThinkTank with a baby boomer group. It feels like we spent too much time just on the logistics and how to get in and stuff ourselves into the meat of it. And I can and I can only assume that this group of 27 or 30 year olds were really engaged and really embrace this type of platform. Bob: [00:20:17] No doubt they were very engaged. Peter: [00:20:19] And I think about this from a from a big… Because you know very large client and like you said nobody had to get on a plane. Nobody had to travel. Nobody had to be away. Nobody had hotel rooms. So I would have I would assume that the cost of the platform is less than what it would cost to bring everybody together at a location to do the exact same exercise. Bob: [00:20:42] Oh yeah in this case the client has a very cost-efficient license, and they’re able to use it almost like if they were using their own office conference or something like that. But again we’ve got people all over the country, from different parts of the world, on this. That we have some people from Europe. We have people from Latin America and Canada. So it was truly a global session. Peter: [00:21:08] That’s cool. So. And at the end of the day, end of the session, they’re walking away because you’re providing them a report from everything that was transcribed. And these breakout sessions and the keynote in the main session. They’re getting that document correct? Bob: [00:21:27] Yeah the client of course really values having to document because they are wanting to analyze all the input on those questions and the participants can also access it as well because this learning initiative has a learning environment where they can go to access content and other resources for the whole two year journey they’re on. Peter: [00:21:53] So think about this and think about a conversation. I mean you see so many applications for ThinkTank within an organization and you were discussing about using ThinkTank as an onboarding process. Bob: [00:22:09] Yes. I mean you and I when we wrote the article we immediately envisioned that a collaborative learning community the whole concept of learning through collaboration could be used with onboarding. Because there’s a famous book called The first 90 days which was written about 20 years ago, and it basically suggests that if you’re onboarding new hires or experience hires, and you don’t get them fully on board in everything they need to know (people they need to meet, resources they need to find and know where they are, things they need to learn about the company like policies and procedures and core values). You not only can’t cover all of that in a one day new hire orientation session, but even if you could they never remember it all. Bob: [00:23:02] So to be able to have a 90 day collaboration community in ThinkTank, where let’s say over a 90 day period you might have five scheduled collaboration sessions of two hours each, and then you might have some other time where there were asynchronous resources in ThinkTank that you could go and look at. This to me is a breakthrough in terms of thinking about a 90-day onboarding process. And we really envision that in our article and now I feel like if I could find a client that wants to do it I feel like I’m really ready. Peter: [00:23:40] So because it’s critical to get somebody on board and acclimated within those first 90 days because if you don’t the probability of them leaving the organization dramatically increases. Correct? Bob: [00:23:52] Absolutely. And not only that but they’ll start… They may even come in to work every day and they may not be as confident as they would if they learned everything they need to know in that first 90 days. And we can all relate to that because we’ve all had different jobs and we’ve all been through a poor onboarding experience and maybe a pretty good one, but most companies have trouble with this because they they try to fix the problem of onboarding new hires with a two day workshop. Peter: [00:24:23] Right. And that that doesn’t stick. There’s got to be some follow up after that. You just just can’t cut them loose. But a lot of times they do too. Two day workshop. Two hour workshop. whatever. OK. Now go to work. Bob: [00:24:38] I mean I have had experience with this and another large client. I’ve told you this story where we had knowledge networks established and they were in Sharepoint, and we basically created a new hire network in Sharepoint and after a two day workshop we basically gave people the link to their next 88 days, and they were going to be in in the new network. But that was all asynchronous. And although I think it was very interesting and there was a lot of good interaction, I believe that you do need to bring people together and have live collaboration community discussions in order to really get people engaged. Peter: [00:25:22] And I remember we were talking about this when we wrote this article… as I think about that and using ThinkTank to create this collaboration vehicle I think it’s critical right now. I think ThinkTank would be a very valuable tool for companies to use in trying to deal with this new revenue recognition principle. Bob: [00:25:57] Yeah absolutely. I mean you and I have talked about this a lot. The model for technical training on the new issue within the accounting firms and in the accounting profession… That model hasn’t really changed for 60 years. And it’s get a guru to give an update, whether they do it in a classroom or whether they do it in a virtual classroom, and they’re giving the update on the new issue right at the beginning of the process. And at the time people attend that… number one they may not be needing to implement the issue for another six months, so that the training is not just in time. And secondly, at that point that a new issue is being released, there’s very little experience in implementing it. So what really would be valuable is, let’s say on revenue recognition, a 12 month collaboration community experience where people came back once a month and they shared experiences they were having with implementation, and this can even be done in breakouts by using let’s say company size breakouts or industry breakouts. So if you are getting if you are getting a plenary session from Pete Margaritis for 30 minutes and then he said let’s break into 10 industry breakouts now. You all know what industry you’re in. And if you go to the right breakout you’re going to probably get a lot more value out of this and if you go to the wrong breakout. Peter: [00:27:33] Right. Right. I mean this is a great tool for AICPA to put it into the learning platform to do something like that. I love that idea. Bob: [00:27:41] Yeah I don’t and I don’t want to make people think this is all about the platform right. This is ThinkTank is an enabler, but without really good facilitation, and really a lot of confidence going in that this is going to work, then the platform itself is not going to have any magic to it without a great facilitation team. Peter: [00:28:05] Correct. And that goes to that same that would go into a live classroom. But I think when I when I look at the two side by side and I go if I get a live group here I may not get everybody’s thoughts or ideas. I might just get a few, but ThinkTank has the ability to get all the ideas from people from everybody in that group, which makes it a much more richer experience, from a learning perspective, than just getting responses maybe from two or three people and then a live audience. Bob: [00:28:40] Yeah. You know if we had revenue recognition as a topic and the first thing we did with a group of people who read the new pronouncement and had begun to think about implementation. If we asked them What are your questions. And we just had to type in questions one at a time, question after question. We then can take all those questions and we can cluster them into themes or buckets. And within a matter of five or 10 minutes, you’ve got hundreds of questions clustered into seven or eight buckets and you can never do that in the classroom. Peter: [00:29:20] No. Not with any speed or accuracy or just yeah. That would be, to some degree, too much. But yeah you can’t do that. You can you can design the course the content and develop the course as you are conducting the class. It’s almost like doing the class on improv where You tell me where you want this to go, you give me the questions, and then we’re going to take that and build the rest of the day the rest of the two hours around that so we can answer your questions. Bob: [00:29:52] Yeah absolutely. I’ve always felt, and again the same thing applies to onboarding, you know within the first 30 days you’re in a new company and you have colleagues that you met in a new hire orientation program… you’re all going your own way, you’re all walking different halls, you’re all meeting with different customers, you’re all using your computer in different ways, and you could all share your learnings and share your questions. And when you do that number one there’s a sigh of relief from people thinking “Wow I’m glad I’m not the only one who hasn’t figured that out.” And then there’s also a sigh of relief thinking I just learned seven things here today that will help make my life easier the rest of the week! Bob: [00:30:46] It’s amazing that this stuff is not happening. And we read about problems with boarding programs all the time. It may be one of the most deep dark secrets in learning and development teams in all companies is it’s hard to get onboarding right. Really hard. Peter: [00:31:06] And it’s so critical, but it is so hard to do that. That’s that’s correct. What other applications do you see ThinkTank being used on? Or do you have something coming up that you’re developing for a client that you’d like to share? Bob: [00:31:20] Well I really believe in the power of it for virtual classroom. And again just similar to what you said earlier. I originally thought well I’m going to do a virtual classroom session as you know I do a writing course that is a very very very good course that was actually developed with a colleague 15 years ago and we did it for the classroom. But now we’re doing it with ThinkTank and that course of Initially I might have said Well 25 participants is the most we can do. But now I believe we could do 75 in a skill building course and if you think about that again you rarely would see that in a face to face environment. And people want it because they’d like to scale courses to as many people as possible. But as you know when you do that there’s no interactivity. You had 75 people in a ballroom and there’s no interactivity to speak of. Peter: [00:32:21] Right. And Bob let me just say it’s not a very very very good course. It’s an outstanding course! I took the pilot with Bob and a group ,and I have a writing course that I teach a live audience. This thing blew me away into the interactivity, to the skill building everybody is doing. It’s a wonderful course. And I think all companies should should be using that course, quite frankly, because that’s one of the major issues most companies have is the ability for people to be able to write effectively. Bob: [00:32:54] Yeah it is you it’s a huge issue and we’ll be pushing this out more in the in the coming year. I actually I’m glad you me this question though because there is another thing I would like to do and now that I am confidence in these ThinkTank virtual breakouts I should try this. I developed a presentation skills model over 15 years ago and it’s called the three S’s of successful presentations. I have delivered that course face to face in many companies, When I was chief learning officer and global head of learning. And I have tried it on ThinkTank but when I did it I had a small group. You know I had seven or eight people, and it was virtual. But now I think I could probably run that course for 50 people or 100 people. And I would put them into breakouts to do, and this would take longer than you know 40 minutes — It might take two hours — would be to practice their presentation skills that they just learned. So going to break breakouts and present to each other if you will, get feedback in the breakout on how you did, and then come back to the main room and ask questions. And now you’ve asked me this question I think I’m going to start working on this next. I’m going to start working on this next month because I basically have the course and it’s just it’s just a matter of designing the virtual breakouts! Peter: [00:34:28] So I have to ask, what are the three S’s? Bob: [00:34:31] Structure, substance, and style. Peter: [00:34:36] I’m writing those down. Bob: [00:34:37] Yeah I develop this based on my experience. I have a kind of a guru in each of those three areas that I’ve looked to as inspiration for presentation skills for Many years, and I just blended them all together. Peter: [00:34:56] Nice. Nice. Well when you do get this course up and run it I’d like to sit in on the pilot. 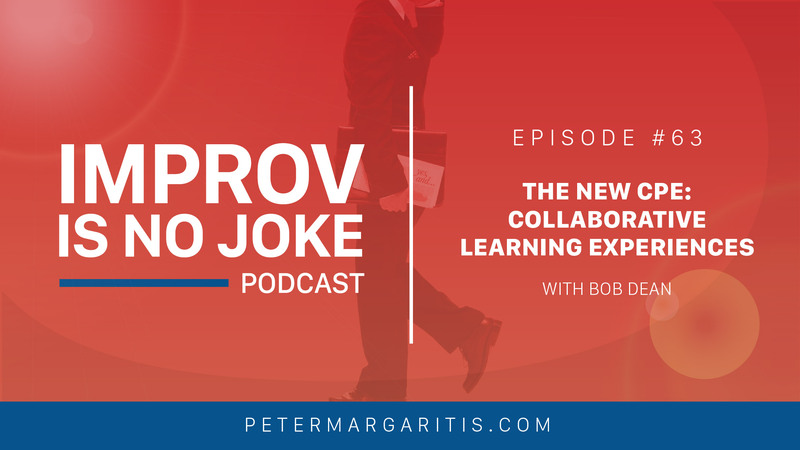 Bob: [00:35:03] Well the other thing we could do… you and I went through an improv course together. Maybe we can figure out how to get our virtual improv course off the ground and have people going to break outs to practice. Peter: [00:35:14] Yeah I know I think about that often and how to get that thing up and running and interactive. And now that’s… you know I have to put some more thought to it over the next… I’m getting ready go on vacation and while I’m on vacation I’ll put some thought to it because that’s when I get to do some thinking. Kind of as a wrap up the last words that you want to part on to our audience about this virtual collaboration? Bob: [00:35:43] Yes I think I’ve been a big believer in the power of virtual collaboration communities ever since I first started using ThinkTank seven years ago. And then you and I met Tom Hood, and Tom has a point of view around learning from collaboration that is very compelling. He basically says in a world where change is happening faster and faster every week, we have to learn faster. And the way we learn faster will be learning through collaboration. It’s going to be faster than learning from experience. And I think that’s a very true statement because when people learn from experience they do have some rich learning, but they have a tough time sharing them with other people, and with ThinkTank we could learn from experience of like in the case of that revenue recognition learn from implementation experiences, but share them and ask questions about them and they have a whole group go away more excited about what they’re going to do next because of collaboration. So I think I feel like this is much nearer a reality. And I guess the thing that’s good right now is when people went into this 10 session with a hundred people and they went into virtual breakout groups… it didn’t feel that radical because we have done that in hotel ballrooms. Peter: [00:37:17] That’s very interesting. Yeah and I agree wholeheartedly with what Tom Hood said about the way we need to learn through collaboration versus experience. And I’m aligned with you on this Bob that I think I think the platform of ThinkTank versus WebEx to some of these others leads us down into that true collaborative community. And I’m I’m looking forward to seeing how this continues to develop because like when we wrote that paper five years ago. Yeah it did seem to be almost you know kind of far fetched at the time but it came true awful quick. Bob: [00:38:02] Yeah and for those listening to this that are worried about getting CPE, there is a way to turn on name tags in ThinkTank and have people do an interaction every 20 minutes. So we can tell if they’re present. So if that’s a big deal, you can combine collaborative learning communities with CPE compliance. It’s possible in ThinkTank. Peter: [00:38:29] Yes it is possible. And I guess the key here is turning the name tags on verses… because there’s no back reporting that everybody logged in. But you don’t know when people do log off during the session do you? It’s not it’s not in the report is it? Bob: [00:38:47] No you really can’t can’t can’t tell. So you know but but again in a room full of 100 people you have trouble telling if two people walk out of the room too. Peter: [00:38:55] Right. So the name tags are critical and that in order from a compliance aspect. Well Bob I appreciate you taking time to share this information, to share this discovery with my audience. And if somebody wants to get in contact with them how can they find you? Bob: [00:39:13] Well you can finally find me first by searching on LinkedIn for Bob Dean, but also you can e-mail me at RobertHDean@comcast.net. Peter: [00:39:28] And Bob’s located in the Chicago area and I will leave the conversation by saying Bob’s two favorite words: Go Cubs. Bob: [00:39:44] Yeah, we got a couple months to get back to where we need to be for the World Series this year. Peter: [00:39:50] Bob’s a big Cub fan and he actually goes to a lot of the games. He’s going to the Cubs Cardinals game tomorrow at 3. So I wish the Cubs luck. I mean my reds are so far out of it it’s it’s just not even worth even cheering for them. But I like to loveable Cubs get back to get back to the world series again. Bob: [00:40:12] Yeah it’ll be another great fall if they do. Peter: [00:40:17] Hahaha. Well thanks again Bob I appreciate it. Bob: [00:40:18] OK. Thank you. Peter: [00:40:23] I would like to think Bob again for being a guest today and sharing his thoughts on his recent experiences with virtual collaboration and the power of ThinkTank. I have partnered with the Maryland Association of CPA and the business learning institute to bring exciting new learning opportunity for accounting professionals to earn CPE credits you can earn up to one self-study CPE credit for each completed PI cast episode purchased for only $29 through the Maryland Association of CPA and the business learning institute self-study website. The podcast episodes are mobile friendly. Open your browser on your smartphone tablet or computer. Go to the Imay CPA belie self-study account and listen to an episode. Take the review and final exam while you’re working out. After listening to an episode on your commute to and from work it’s that easy. Also like to improv no joke. Podcasts are available on my web site. Only those purchased in the CPA be self-study Web site are eligible for C-p self-study credit. You can get the detailed instructions by visiting my website at Peter Margarita’s dot com and click on the graphic. Listen Learn and Earn. Improv is no joke podcast on the home page. I hope you enjoy this exciting and flexible way of earning C-p credit. Remember you can subscribe to my podcast on iTunes ditcher and Google Play if you like to purchase a personalized signed copy of my book. Improv is no joke. 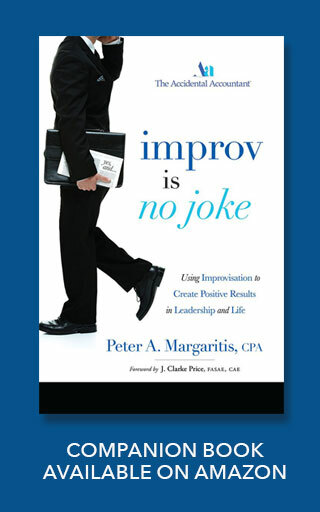 Using improvisation to create positive results and leadership and in life. For fourteen ninety nine and the ship it is free. Go to my Web site and you’ll see the available now. Graphic on my home page. Just click and go to the shopping cart. In addition you can download improvs no joke audio book for fourteen ninety nine so you can listen on the go. You can follow me on social media. You can find me on Facebook by searching the accidental accountant. My Twitter handle is at P Margarita’s. You can connect with me Alington by searching my entire name and on Instagram by searching the margaritas in Episode 64. I interviewed Chris Schier who is the founder of two companies Madison and fifth a marketing agency and joined my table a new platform for prepaid group dining created to encourage community and increase our time spent and real world conversation. Thank you again for listening and I greatly appreciate it if you’d leave a review on iTunes. Remember use the principles of improvisation to help you better connect and communicate with those in your organization.